NuMedica Pan-V is a powerful digestive enzyme that supports the digestive system's ability to efficiently break down proteins and carbohydrates. With its porcine-derived pancreatic enzymes, NuMedica Pan-V Rx can help your body effectively absorb the vitamins and nutrients contained in the foods you eat. There are various reasons why raw-pancreatic enzymes can be beneficial to take. 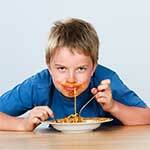 Your physician may recommend that you take them to enhance your digestive process. Sometimes the pancreas does not produce the amount of pancreatic juice required by our digestive systems. This juice contains digestive enzymes that help us break down food and absorb its important nutrients. If there is a blockage in the pancreatic duct or you have a condition that slows the production of pancreatic juice, you may begin to suffer from malnutrition or even weight loss. 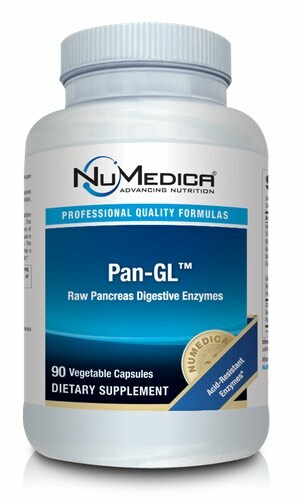 Taking a pancreatic supplement like NuMedica Pan-RX ensures that you have the enzymes you need to break down your food. 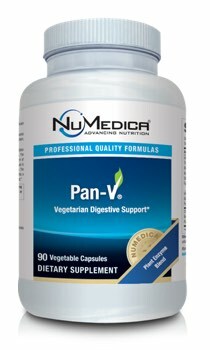 Many people find that taking a digestive enzyme like NuMedica Pan-V can reduce the symptoms of indigestion, which can involve bloating and abdominal discomfort. Naturally, it's important to have your physician evaluate your indigestion to ensure an underlying condition is not present. Often, however, indigestion simply occurs with age. Your doctor may recommend that you begin a course of digestive enzymes to improve your body's digestive process. Other Ingredients: Rice maltodextrin, cellulose (vegetable capsule), vegetable magnesium stearate, MCT (medium chain triglycerides), silica.